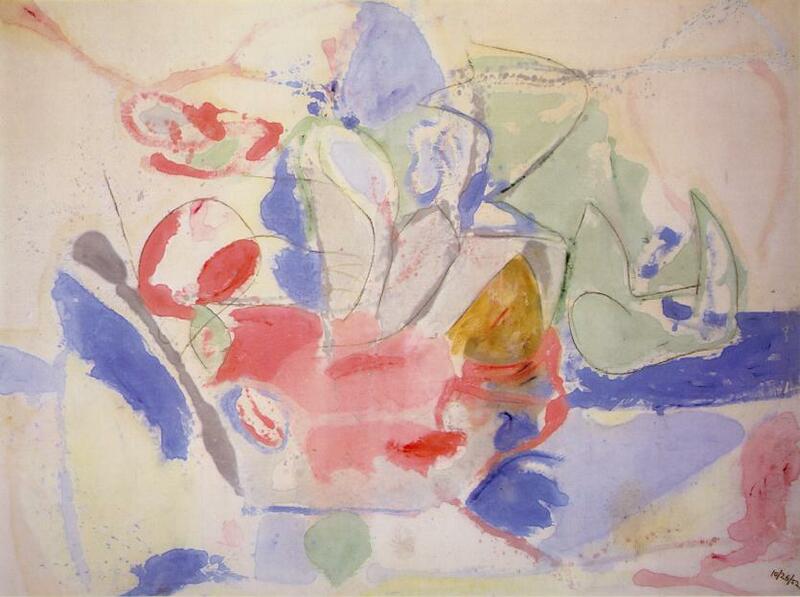 One of Helen Frankenthaler's most famous paintings is "Mountains and Sea." She creates beautiful paintings that look as if she uses watercolor paint and painted very delicately. To achieve this effect, Frankenthaler drew lines and poured some type of fluid over them so the lines would smear and spread and looked washed away. Many of these works appear as a bunch of abstract watercolor stains. She is an abstract expressionist painter and intended for this particular painting to be a landscape inspired by a trip to Nova Scotia. However, it can easily be seen as a still life rather than a landscape. The objects in the painting are nondefinable, which is why the piece is not easily seen as a landscape, although the green and blue might be a symbol for a vision of land and water. The colors are vert pastel and delicate, making the painting beautiful, yet odd because it is too distorted to see any distinct images, even though she draws lines around the edges of some of the smears she creates.